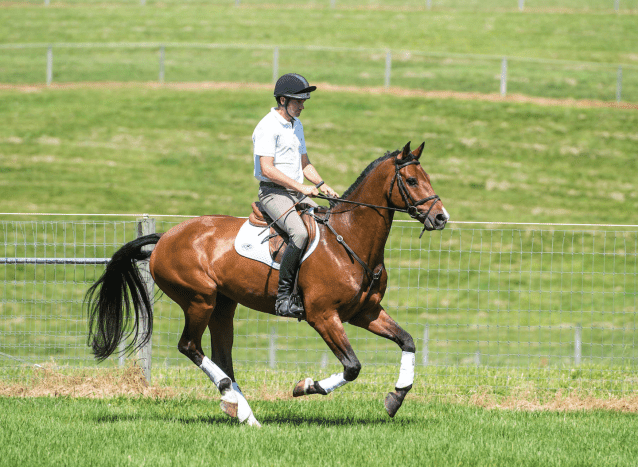 A full lameness exam can help pinpoint subtle signs of unsoundness in horses. 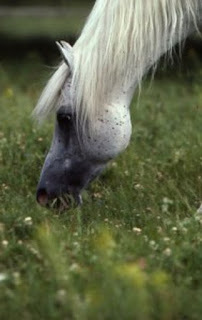 A horse who is head-bobbing unsound is easy to spot, but more subtle signs of equine lameness can elude detection. Failing to notice when a horse is only slightly "off" can lead to a worsening of an injury or delay in treatment that makes a problem more difficult to resolve. Consult your veterinarian if you see any of the following signs. When introducing corners, the key to remember is that jumping corners is all about progression. 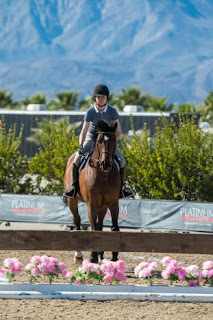 First you need to establish the correct canter on the flat and then work over a simulated corner in the arena before heading out to jump a corner on a cross-country course. 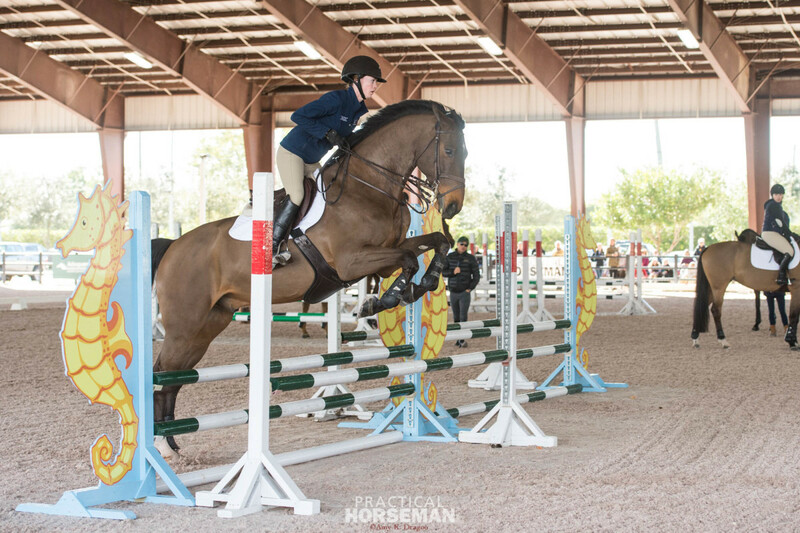 Only then will your horse jump it as confidently as Sarah Hughes’ Alcatraz, a 12-year-old Hanoverian gelding, is jumping it here. 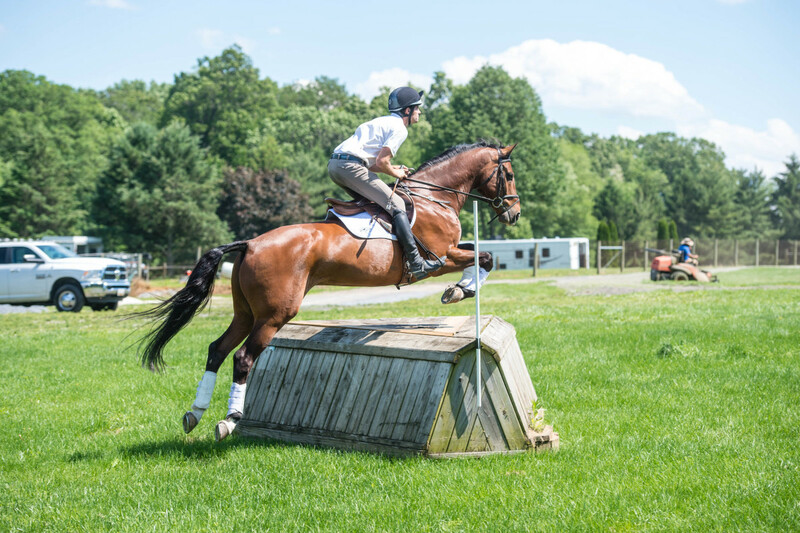 Corner fences are a common element seen on nearly every cross-country course in America. 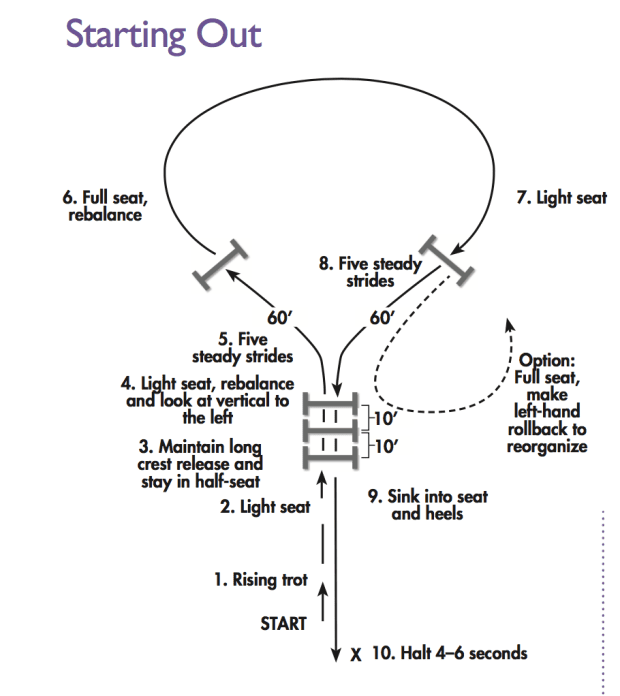 Starting at Training level, horses and riders need to be prepared to answer the corner. When introducing riders and young horses to corners, I use the same approach each time, starting by building a simulated corner in the arena to introduce the concept and then move to jumping an actual corner on a cross-country course. 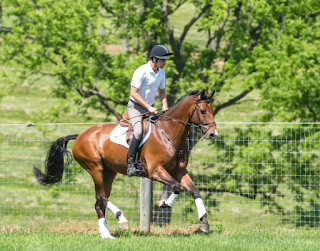 Whether you are training for dressage, show jumping or cross country, there is always a progression. 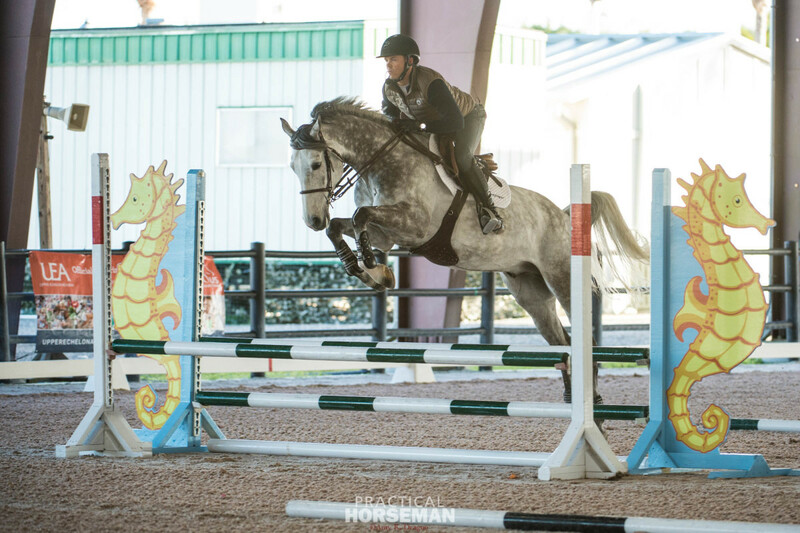 You start with the basics and gradually work your way up, and it is no different when jumping corners. First, you need to have the correct seat, leg and hand aids in place, which I describe in the next section. 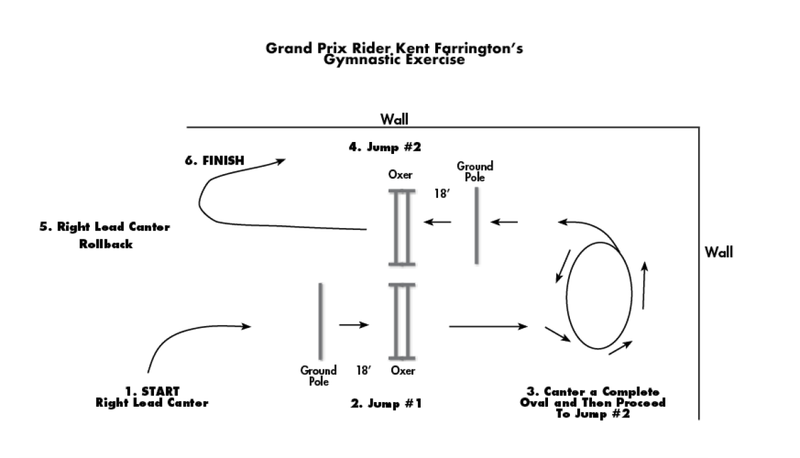 Then you build confidence by jumping a simulated corner in the arena using a barrel and two standards, which will set you up for success when you leave the comfort zone of the arena and jump a corner on the cross-country course. You can practice developing the correct canter in the arena or wherever you do your gallops. I start by working in the between-the-fences pace I use while going cross country—galloping forward at a faster speed. 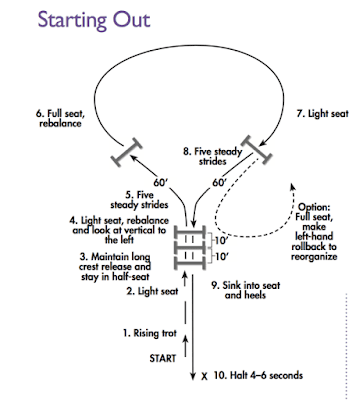 You will be in two-point with your seat out of the saddle and your knee at a 110-degree angle. 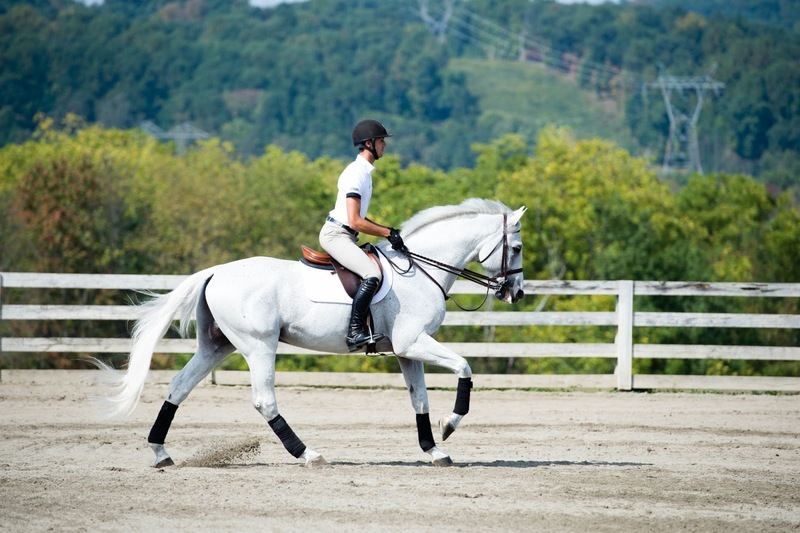 Be sure to shorten your stirrup leathers enough so you can keep your backside off the saddle in your two-point. Now I start to bring my upper body back and slow Alcatraz from the gallop to a positive, forward canter. This is the canter I establish before a corner. 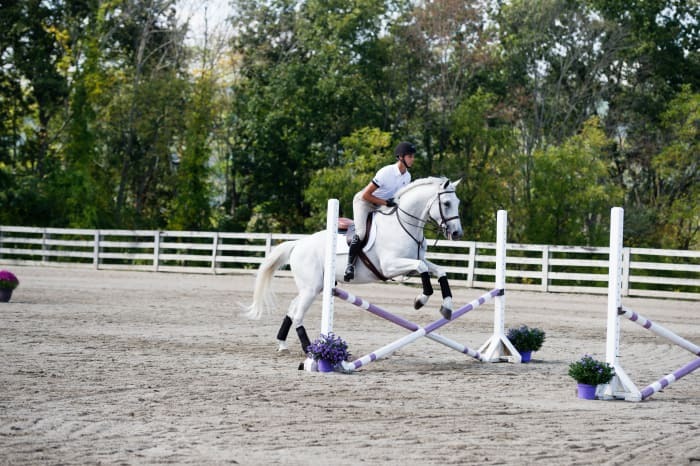 To practice, pick a marker in your gallop field, like a tree or jump. 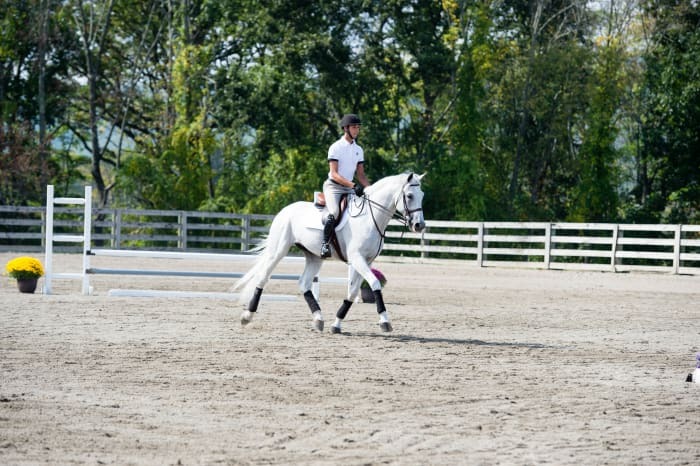 Practice slowing from your gallop to your desired canter by the time you pass the marker. 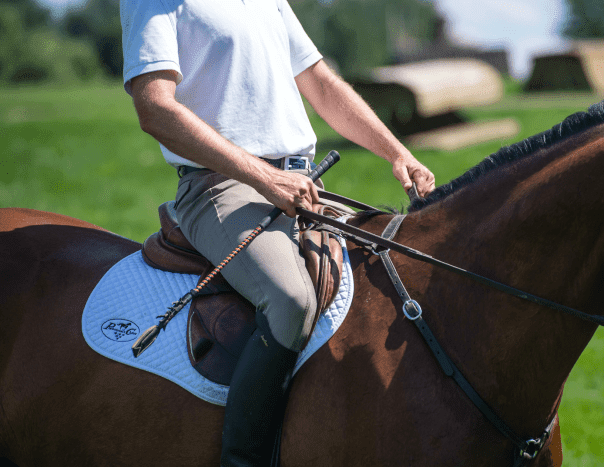 Depending on how quickly you are able to slow and balance your horse, you might need to start well back from the marker. The more you practice, the easier it will be to make that transition. Then I sit firmly in the saddle in a defensive seat, bringing my upper body back so it is upright. My legs are in a steady, driving contact with Alcatraz’s sides—think Phillip Dutton and his vise-grip legs—which makes it clear to Alcatraz that I want him to go forward confidently. This is the position I use four to five strides in front of the corner. Q: I am trying to be more at one with my horse mentally. I try to be in the moment, but I’m not always successful. Any tips would be appreciated. In Part 1, top trainers Traci and Carleton Brooks will teach you how to tune up your eye. Getting your horse to produce his best jumping effort over every jump is all about finding the right canter for the approach and using your eyes. Lexi Wedemeyer is demonstrating this perfectly here. She and her horse are both in excellent balance and focused on the jump. She’s already found her distance to the takeoff spot and is just about to raise her eyes to a focal point in the distance. Have you noticed that as you ride around a course, it tends to get harder, rather than easier? That’s because you have a constant stream of variables to tackle, including the questions posed by the course’s turns, jumps and striding options as well as the many aspects of your and your horse’s performance, which can change from one second to the next. Maybe he lands off a jump with too little pace and threatens to break to trot or perhaps your balance tips forward onto your hands. If you don’t address each variable immediately, you won’t be ready to face the next challenge in time, so things can unravel quickly. Instead of schooling courses over and over again at home, the best way to prepare yourself for these high-pressure situations is by practicing specific exercises that zero in on the most fundamental skills you need on course. We’ll share three of our favorites in this article. 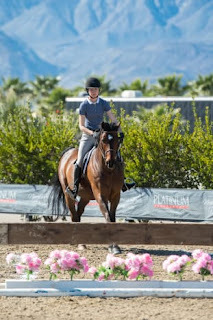 Whether you’re a beginner just learning to ride courses or a more seasoned competitor heading to Indoors, these exercises will improve your balance, accuracy, feel and eye (ability to judge the distance to a fence) while improving your horse’s obedience, adjustability, responsiveness, focus, balance, rhythm and straightness. When you set up these exercises, we recommend using as many solid obstacles as possible—walls, logs, barrels, etc. 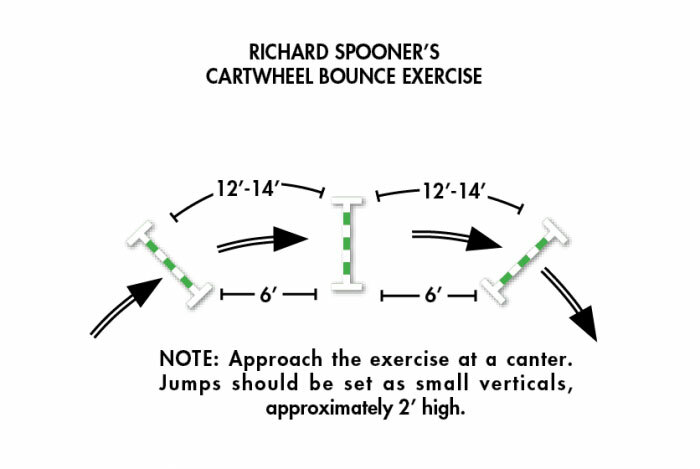 These give you an actual barrier to jump, which helps you focus and encourages your horse to jump around the fence in a nice round shape. There is no need to make any of them big (even with advanced horses, we don’t go above 3 feet). 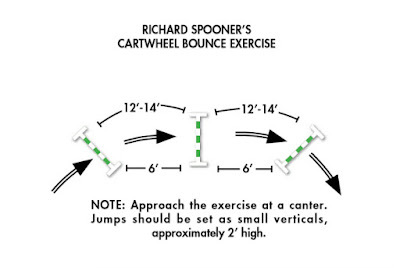 The purpose of all of these exercises is precision, not jumping high. Beginners can replace any of the fences with small crossrails, cavalletti or ground poles. We always advocate using both reins to steer so that you’re influencing the largest part of your horse: his shoulders and belly. 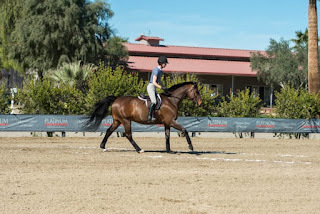 In general, control your turns by balancing and steadying with the outside rein and leg and guiding with the inside rein and leg. Sometimes you may need to use one rein more than the other, but always keep contact with both. We’re also big proponents of visualization. Before you begin each exercise, study the diagrams, then ride through it in your mind. This will make your sessions more productive. 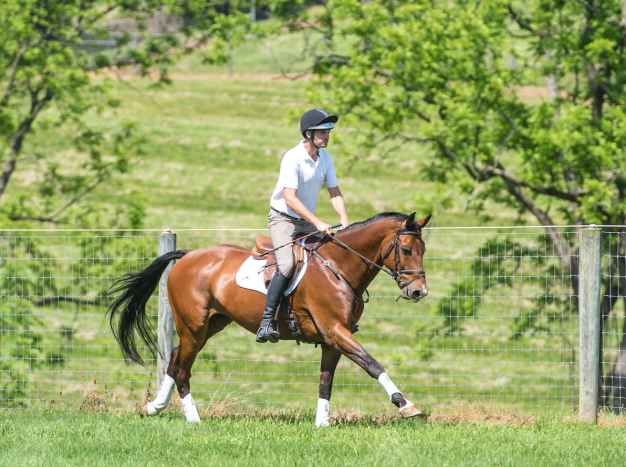 Start by picking up the canter on your horse’s better lead and establish a good rhythm, making sure he is between your leg and hand. You should feel him “filling in the reins”—offering equal pressure in each hand—so you know that he’s ready to respond to your aids. Ask yourself, “Does this feel like the right canter? Could I open or compress the stride if I need to?” Then start counting out loud in rhythm with his stride—“One, two, one, two.” As you approach the jump, raise your eyes to a chosen focal point in the distance, parallel to or just above your eye level, while keeping the jump and track to it in your peripheral vision. 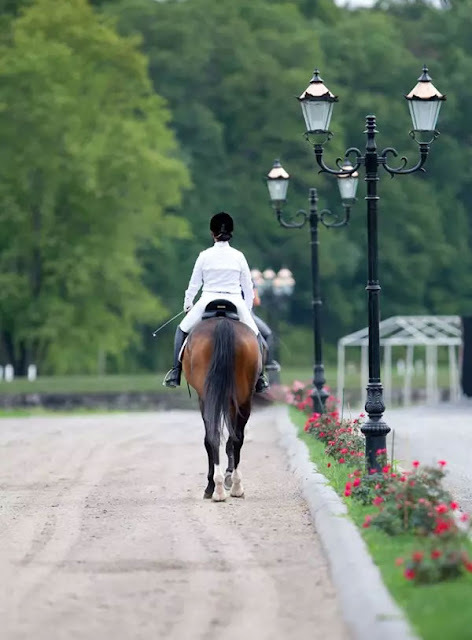 As you enter the marked lane four to six horse lengths away from the jump, try to judge whether you’re going to arrive too close (deep), too far away (long) or just right. Here, you can see Lexi has entered the lane in a nice medium canter—not so forward that she’s at the end of her horse’s stride, but not short and choppy either. He’s traveling in a good balance and “filling in the reins”—you can see the contact is neither slack nor too tight. Lexi has recognized that she needs to move up to a forward distance, so she’s lightened her seat. However, she’s gotten slightly ahead of the motion. We’d like to see her weight shift back closer to the middle of the saddle, which would open the angle in her elbows more. Lifting her eye and chin would help to accomplish this. In Lexi’s next approach to the jump, the distance to the takeoff spot is a little long, so she opens her inside rein to bring her horse in on the curve slightly. 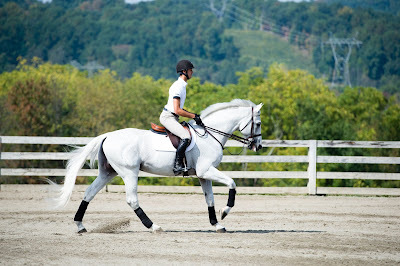 At the same time, she maintains contact with her outside rein and supports him with her outside leg. This controls his belly and shoulders (so he doesn’t bulge his shoulder out), as well as his head, so the shape of his body mirrors the shape of the curve. With this slight adjustment, they’ll jump the fence where you see the white circle. 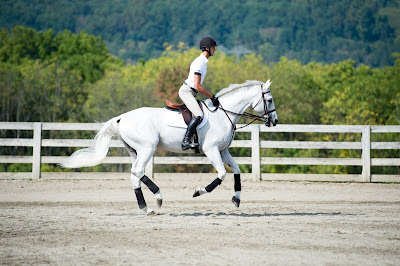 Notice, too, that she’s starting to close her hip angle to be ready to go with the motion when he leaves the ground. This time, Lexi’s distance to the takeoff spot is deep, so she adds pressure with her inside leg and takes both hands to the left to encourage him to fade toward the outside of the lane, aiming to jump the fence where you see the white circle. Again, she’s doing a good job of making the shape of his body mirror the shape of the track (rather than pulling his head to the outside, so his body curves away from the track). Notice how square her shoulders are to the fence. This is easier to achieve if you think of your outside shoulder being the last part of your body to come around the turn. Doing this also helps you to maintain contact on the outside rein and keep your outside leg against the horse’s side to provide support. Your eyes are the most dominant part of your ride. 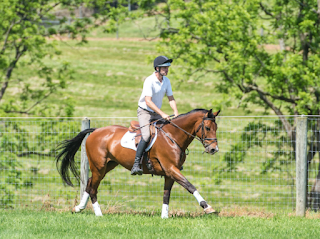 Where you focus them not only determines where your track will be but also significantly affects your balance, which, in turn, influences your horse’s balance. 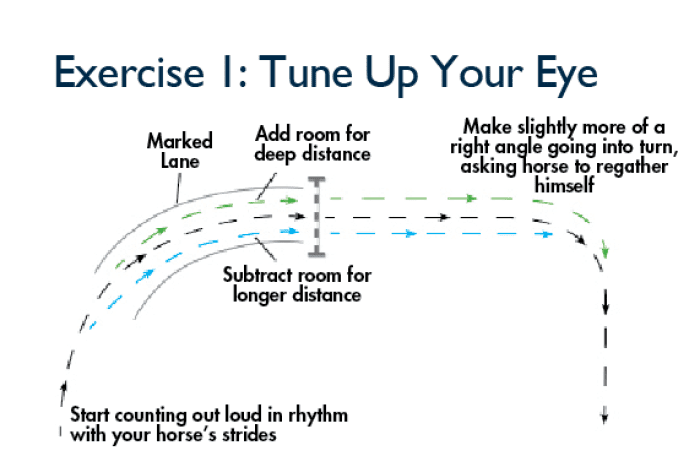 Keeping your eyes level helps you maintain your balance and stay anchored and safe on the horse. A common issue we see is being ahead of the motion, which can be resolved by raising your eyes. Choose focal points that are at or above your eye level. If your eyes are 10 feet above the ground, that means your focal point should be 12 to 16 feet high (depending on how far away it is). We all naturally tend to drop our eyes, so it’s always important to raise them slightly higher than the intended focal point before letting them settle down to it. For example, if you’ve chosen a tree outside the arena to focus on, look first at the very top of it—don’t start down at the trunk. This technique is especially useful over fences. Use it to get the idea of “up and over” in your mind and body. That way you won’t be tempted to lead with your shoulders, which tips your balance too far forward, but rather with your chest and the tops of your hips. 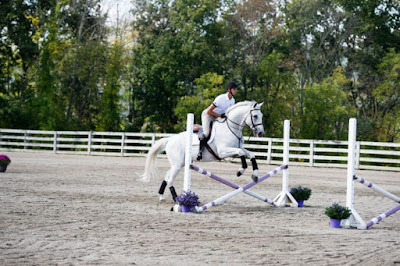 The idea is to let your horse jump up to you and then you follow, allowing his jump to close your angle. 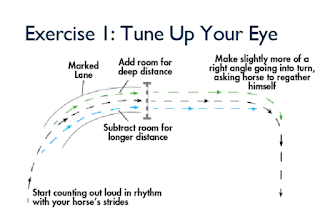 As you warm up on the flat, choose a focal point outside the ring and practice riding around a bend or half circle that ends on a line heading toward the focal point. 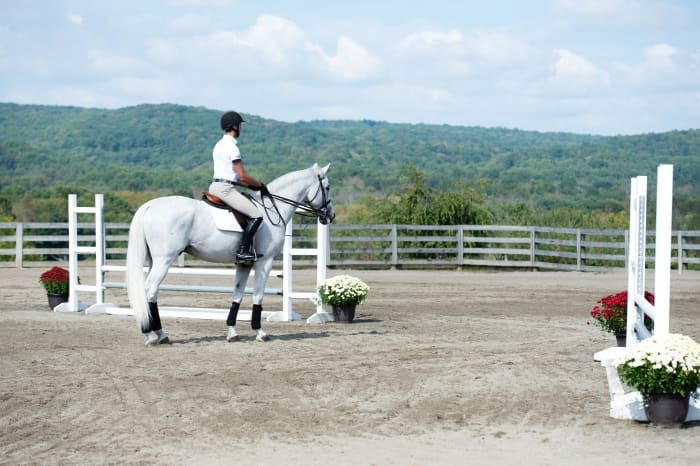 As you trot or canter around the bend, raise your eyes above the focal point, then let them settle down to it. When you get the hang of this sensation, identify more focal points around the ring and do the same with them. This is a great technique to incorporate into your warm-up at shows, too. Now set a small vertical on one end of the arena, far enough off the long side so you can jump it on a curve from either direction and then end up traveling perpendicular to that small vertical after landing. Jump this a few times on each lead to warm up. Next, use agricultural lime (available at garden and hardware stores), spray paint, polo wraps or foam poles (or pool noodles—be creative! 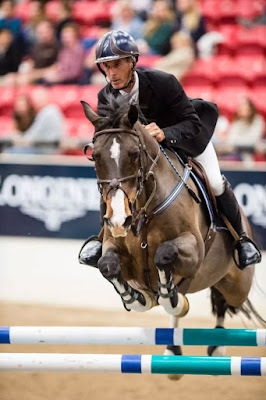 )—anything a horse can step on safely—to mark the edges of a curved lane starting at the base of the jump and extending several strides away from it in both directions (so you can jump it on both leads). Make sure your horse can travel straight for one or two horse lengths before and after the fence. The result will be a large half-circle interrupted midway through by the jump. Make the width of the lane 9 to 10 feet if you’re a beginner and slightly narrower if you’re more experienced—but no narrower than about 6 feet. Widen the lane by 2 or 3 feet at the base of the jump on both sides. 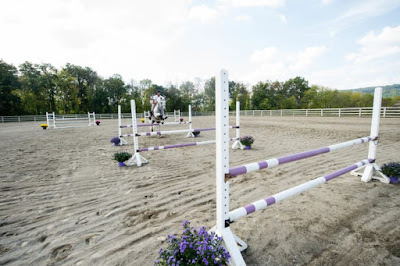 Do not use solid poles for this purpose, as they could injure your horse if he steps on them. 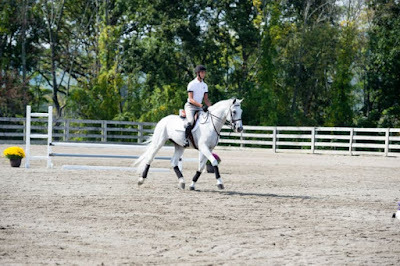 Starting on your horse’s better lead, canter a few circles to establish a good rhythm. Then start counting out loud in rhythm with his stride—“One, two, one, two”—as you enter the lane to the jump. Meanwhile, raise your eyes to a chosen focal point in the distance, keeping the jump and the track to it in your peripheral vision. Initially aim for the center of the vertical. 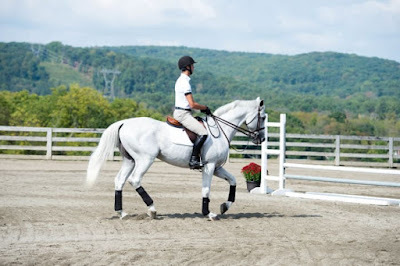 After your horse lands, keep straight for one or two horse lengths, then make your turn in the next corner slightly more square (closer to a 90-degree angle) while asking him to regather himself for the next straightaway. 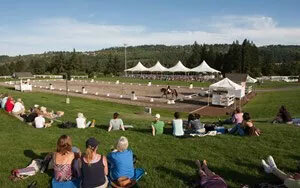 Then circle across the arena to jump the fence again. After doing this six or seven times, change direction and do the same on the other lead. Next, approach the vertical with a new plan: When you’re four to six horse lengths away from it, try to judge whether you’re going to arrive too close (deep) or too far away (long). 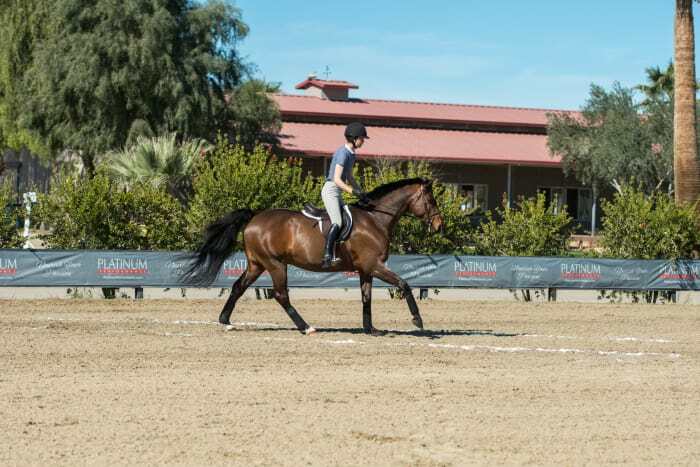 Adjust your track accordingly: If you’re going to be deep, open your outside rein slightly and use some inside leg to encourage your horse to fade toward the outside of the lane. If you’re going to be long, open your inside rein and use some outside leg to bring him in a little. When you’re jumping on a curve like this, changing your track by as little as 4 inches to the left or right can add or subtract as much as a foot to or from the distance your horse has to travel to the takeoff point, so keep these adjustments very small. Be mindful about his entire body, not just his head and neck, asking him to be perpendicular to the fence one to two horse lengths before and after it. After doing this six or seven times, change direction and do the same on the other lead. Developing a good eye takes time, so be patient with yourself. Instead of concentrating on the jump, think of it as just another canter stride. Try to keep the same pace and rhythm throughout the approach, jump and recovery. If you have trouble judging whether you need to fade to the outside or inside in the approach, ask an experienced rider to stand about six lengths in front of the jump (and a few feet to one side, so you don’t risk running him or her over) and give you input as you ride by. This story was originally published in the August 2017 issue of Practical Horseman.